The inaugural SFIA Industry Leaders Summit was held last month at the Four Seasons Hotel in Baltimore, MD. It was a well attended and highly recognized event as many industry execs sung its praise. For a recap of the event, click here. If you didn’t attend, we have compiled a photo journal so you can experience the event and see what you missed. Stay tuned as the 2014 Industry Leaders Summit date and location will be announced in the coming months. Baltimore Business Journal article on Kevin Plank’s keynote at SFIA Industry Leaders Summit. 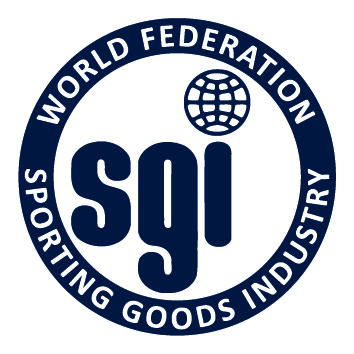 SGB Weekly with feature article summarizing the SFIA Industry Leaders Summit. SFIA staff preps Summit name badges for attendees. SFIA President and CEO Tom Cove kicks off the Summit with a State of the Industry presentation focused on the declines in participation. Jim Baugh discusses the effect decreased participation will have on the entire industry. Mitchell Modell comments on decreased participation and how the industry needs to coalesce around the issue. SFIA Platinum Partner ETS’ Ed Vaughan introduces Kevin Plank to the stage. Under Armour Founder and CEO Kevin Plank delivers the first keynote on what he sees the future of the industry looking like. Attendees enjoy lunch overlooking the Baltimore Harbor. Robert Reiss talks about what it takes to become a Transformative CEO. RW Baird’s Joe Pellegrini keeps us up-to-date with what’s going on in the M&A market. Participation was a big topic for the pro sports panel which featured the MLB, USOC, NBA, NHL and NFL. Attendees enjoy pre-dinner drinks thanks to SFIA Platinum Partner ETS. SFIA Future Industry Leader Scholars are recognized at dinner. Firends of the Industry Leaders Summit recognized at dinner for their support of the event. SFIA Platinum Partner ETS recognized for their support of the association with SFIA Board Member and Under Armour Vice President Matt Mirchin. SFIA Gold Partner Exponent recognized for their support of the association with SFIA Board Member and Under Armour Vice President Matt Mirchin. Hugh Hewitt delivers the Political Keynote at dinner of the SFIA Industry Leaders Summit. RetailNet President Dan O’Connor kicks off Day 2 with a presentation on the Drivers of Change in Retail. Renowned Economist Jeffrey Rosensweig made economy fun with his presentation on the latest trends. Aspen Institute panel on the business model of Sport for All. Tom Cove moderates the CEO Panel featuring leaders from Sears, Century M.A., VF Corp. and Brunswick. Ted Leonsis wraps up the conference with a talk on what the future holds for the industry via technology. You can find more information about the SFIA Industry Leaders summit at www.sfia.org/ils.